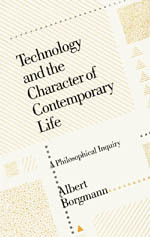 Note: This entry is part of a series where I am blogging chapter-by-chapter through the book Technology and the Character of Contemporary Life (TCCL) by Albert Borgmann. If you’re new, you may want to start at the Overview. This is the last chapter in the section on technology and its relationship with the political aspect of society. One of Borgmann’s primary insights here is that technology is a good explanation for the social and political apathy that is so prevalent, yet so disturbing in a nation like the US whose founding ideals are very much linked with political engagement. The primary reason for this state of things is that politics has become the “metadevice of the technological society” (107). By this Borgmann means that the political system has itself taken on the characteristics of the Device Paradigm—procuring certain commodities for us while relegating to obscurity its own inner workings. And it is a “metadevice” because what it is now primarily concerned with procuring is the smooth functioning of technology in society! Government has become the servant whose purpose is to keep the technological machine humming, because this machine is what society now generally feels is the key to fulfillment and equality. It is easy to see the “deviceification” of government at work. Its bureaucracy is Byzantine, and as citizens we hardly know how it works other than that our taxes go in and various social services and protections come out. The human and personal are not at home in a system like this (as an anecdote, I called the California DMV earlier this week, and was greeted with a customer service representative’s bored voice: “Hello, this is <muffled> 478, how may I help you?”). Huge governmental structures have been built up with the sole purpose of eliminating disturbances in how we go about procuring commodities. With this as the primary goal, it’s no surprise that citizens have no particular reason to be engaged—unless our ability to live out the aims of technological availability become threatened. This doesn’t mean that technology has blocked all possibility of genuine political engagement, but for most of us it’s a moot point. We’ve become apathetic essentially out of contentment. But this raises some important questions. What about the energizing democratic ideal of equality? Surely no one would say we’ve obtained full equality in our society. Shouldn’t technology through its equalizing tendencies spur on political engagement around this ideal? Unfortunately, it doesn’t work that way. Despite what Borgmann calls technology’s “weak” tendency towards equality, there is a deeper process at work. We tend to measure inequality quite bluntly from the perspective of income (which is itself defined in terms of technology—essentially as the rate of commodity acquisition available to us), rather than many of the other qualities we could choose to measure. Income reflects work; the more you work, the more income you have. Thus it all boils down to how hard one works. Inequality incentivizes work, so it’s a good thing we have inequality to help kickstart the economic engines. People are just in the dark when it comes to inequality, so it sticks around. None of these claims are true. Borgmann’s explanation is that inequality gives a clear indication of what the stages of technological availability are, and therefore a promise of what a given individual will be able to procure in the future. What the wealthy upper classes have access to today, through the gifts of technology will be available to the middle classes in 10 years and the lower classes 5 years after that. Thus in a technological society inequality is constant, but quality of life is like a moving escalator—just wait 5 years and you will be able to have the kind of quality of life that higher-income individuals have now. We have a good reason, as lower- or middle-class society, then, to suffer this inequality. If the upper classes drive the development of technology that only they can afford, it will certainly be available to us at some point in the future—we have just to wait. Technology is therefore embedded deeply but subtly into the hopes and goals of our economic reality. True to form, it stays in the background unless threatened. In fact, most actual political energy (despite the recent moral debates in our country) is around maintaining the proper function of this escalator. Substantial inequalities that don’t impinge on the ability to continually procure successively more impressive commodities are ignored or back-burnered. As long as the escalator functions, our focus and energy will be on attaining the next level, on consuming tomorrow what the classes higher than us are consuming today. Thus technology contributes a sort of political numbing effect, a deep disengagement with civic responsibility except where the technological machine threatens to break down. It goes without saying that this makes true political discourse—discussion about matters of the common good and indeed what the good life of society is—impossible. “The rising tide lifts all ships, but it does not equalize them in size” (112). What a great quote, particularly the second part. I couldn’t help but think about this quote in light of OSS. The first part of the quote is used often in the OSS context. It’s the second part that is really interesting. We have the linear path between class differences as you point out. What the wealthy have now, is what the middle class will have in a few years. The rising tide will move all forward but not equalize things. Technology is indifferent to this move but it is not inconsequential. In OSS, is it quite possible that a rising tide indeed raises all ships. But that there is more to the story. All organizations move up (so to speak) from this engagement but not all benefit in the same way from this move. What does Saucelabs get from their OSS engagements? Is this the same for all members of these communities? Not likely but this is okay as there is still appeal in these engagements for all. Technology maintains this appealing promise of getting something positive from the OSS engagement. Side note: I can’t help but think about how the current US political situation has actually de-commoditized politics to some degree. We are no longer taxes in – commodities out. We are starting to see the underbelly of the workings of politics. Yes, I think you’re right about US politics. As the system begins to break down, people begin to see the man behind the curtain, so to speak. And to the larger point of this chapter, I think the conveyor belt of technology is more concerning in real political / social justice issues than in the OSS world, because actual issues of livelihood and so on are at stake. Is it an issue of justice in OSS that ‘inequalities’ are perpetuated? Maybe.